In the first major foreign direct investment project in southern India since the Modi government came to power four years ago, Kia Motors, the South Korean automotive company, announced its plans to invest about 2 billion US dollars in the greenfield plant coming up in Anantapur district of Andhra Pradesh. The first phase of the plant, which will see an investment of 1.1 billion US dollars, will begin commercial production with the rollout of concept, SUV showcased at the New Delhi Auto Show. The company expects to roll out the cars with maximum localization. The Korean company, which has 14 factories, and has global sales of over $45 billion, today held a framework installation ceremony for its first Indian manufacturing facility in Anantapur. The company had expressed interest to invest in Tamil Nadu but the state government virtually cold shouldered the proposal. The company�s new plant covers 23 million sq ft (213.7 hectares) and, once fully operational, will provide approximately 3,000 jobs and produce 300,000 cars annually. Andhra Pradesh government has already taken steps to export these cars through Krishnapatnam port where a Ro Ro berth is getting ready. The road from Krishnapatnam Port to Anantapur is being spruced up. While the Hyundai plant in Tamil Nadu set up nearly thirty years ago is yet to get rail connectivity, Andhra Pradesh government has taken steps to set up a rail head near the Kia plant. Currently one month ahead of schedule, the construction process is planned for completion by the end of the first quarter of next year, with vehicle production earmarked to begin later in 2019. �I believe Kia will bring amazing change and hope to Andhra Pradesh and the entire India. We are here to build more than just great cars. We aim to set a new standard of automotive lifestyle experience by providing Indian consumers with world-class products and service, but also deeply engaging with the Indian people and giving back to the community whenever possible,� Han-Woo Park, President and CEO of Kia Motors Corporation, said. The 75-year-old company, and the eighth largest automotive company with sales close to 3 million units a year, expects to cover the entire global presence with the India factory. It is already present with plants in the US, China, Europe and Mexico. �Our sister concern Hyundai Motors India Ltd, which began its India journey in 1996, has invested about $3.4 billion in India,� he said. The company plans to roll out a small car and a sedan after the SUV production. Kia Motors India will soon start recruiting 3,000 employees needed to operate the plant. The company is currently in discussions with the Andhra Pradesh government to start a joint training program to develop the necessary manufacturing skills among local residents. Kia Motors signed a memorandum of understanding with Andhra Pradesh to build a new manufacturing facility in Anantapur last April. 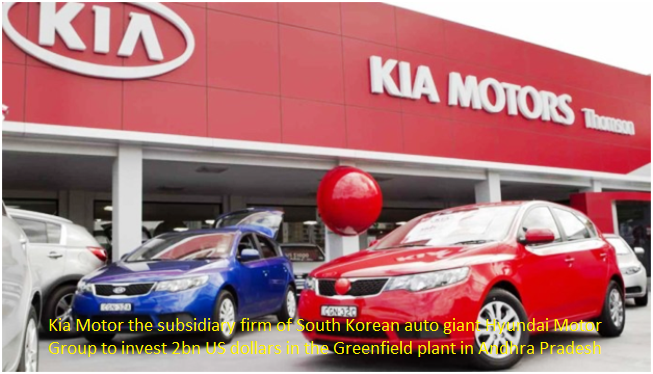 Construction of Kia Motors� first manufacturing facility in India commenced in the fourth quarter of 2017. The manufacturing facility is expected to begin production in the second half of 2019 and produce approximately 300,000 units a year. The Kia management outlined its plans to set up skill training centers which would help them in their manufacturing process.